Sommerfield Farm, thanks for everyones help to find out were this Unknown photograph was taken. This entry was posted in Agriculture and Farms by Picture Stockton Team. Bookmark the permalink. What was the name of the supermarket before Summerfield on the Tesco site, Durham Road, Stockton-on-Tees? I think it was originally called Savacentre…..
Hi there my name is Daniel nugent son and grandson of Ernest nugent I am interested in the ownership of this farm as I would like to purchase for my family could anyone please contact me with any information thank you..
Daniel, there seems to be plenty of links to information about the farm’s ownership and plans for it’s development in the previous comments on this post. Sorry. I don’t but you could try the post office internet site which deals with postcodes as that might help. You could also try contacting Stockton Council as they may be able to help in one way or another. The approved housing scheme for the area includes complete demolition of the farm, with no objections from any organisation as the buildings are not considered to have any important features and are therefore not a listed property. I notice the approved plans do include demolition of the farm house & buildings. If you go on-line and look for the Land Registry site for a small fee [about £3]] they will supply you with the owners details, all you need to supply them with is the address of the property. Hope this helps. if the links don’t work just contact the SBC planning department who will be able to help you . At the moment the land is being farmed by a farmer who has an adjoining farm ,he might know who owns it,you can see the other farm house from Harrogate Lane. The farm is owned and has been for many years by the Cooperative Society and farmed by an estate in Northumberland, it is up for demolition and plans have been submitted for housing. I could put you in touch with the owner? It used to be owned by the Co-op, but given that plans were submitted for redevelopment in the last couple of years, it may now have passed to developers. A search on the planning portal for any planning applications may yield an applicant’s name. The 2015 application for a revision (which was refused) to the approved 2013 plan (350 dwellings) was on behalf of the “The Co-Operative Group”. My friend rented this house during the 1990s she had two horses and I loaned one of the horses in 1998/99. I remember part of the house was walled up and they lived on the left side of the house. They also built an outdoor arena and converted the main barn into stables. I had a lot of good memories when I loaned the horse for three years. I have recently explored this farm and it is abandoned and apparently haunted. Me and my friend found a way into the actual house itself through (what looks like the porch area). Someone has obviously been in before us and denolished the wall. We went into it and the stairs have been burnt as has the rest of the house. We explored the barns and there has definitely been people ruining it. Its been burnt down, the whole thing. I found out yesterday that summerville farm has been bought by Tesco. A worker erecting fencing told me. They could have bought it to reduce the threat of another supermarket being developed here. From what I have read about the farm, it looks like the co-op own the site. It needs to be sold on or done back up, its a nice piece of history as you enter Stockton and the longer it’s left as it is now its just going to get ruined beyond repair… something needs to be done, don’t let this house fall to the ground. In 1939 Summerfield House, Hardwick Hall and Ki-Ora were all taken over by ICI to evacuate various departments from Head Office at Billingham. Supply and Distribition were at Ki-Ora. I think the wages department were at Harwick, if not there, Summerfield. The farms and grounds would be sub let and many farmers farmed them for years. Newstead had three owners starting with Tunstall’s, Codlin, the last was Durhams then the land was sold for housing development. Norton Sports development also benefitted from the land where I used to ride Jack Nicholson’s horses. It was a great field for a gallop. Sorry to hear of the loss of all these fine old places. Much good property has been removed. I am not even sure whether Newman House has gone on Junction Road – perhaps someone could tell me? Corby Lodge was made into a nursing home and Kyle on the other side has also gone. Been there a few times over the past couple of months. Increasingly often, what with the nice weather and a new found enjoyment of ‘photography’. The place was really rather derelict the first time I went, a few months ago. Now, however, it’s a complete wreck, graffiti everywhere (terrible spelling), people have torn down all the cabinets and such inside. Shame. There’s a block, inside one of the barns that reads ‘This Block Was Laid 1984 By Brian’ and another block/plaque/plate/stone, on the front of the house that reads ‘Summerville House March 11th 1871 R.R.P. Truth be told, I can’t see it being about much longer. Which is sad, ’cause it could have made for a cracking house had it been looked after. Me and friends went to visit the abandoned farm today and the ground floor windows which were bricked up are now all pulled off. Also the back door is not there so anyone can just enter the building which is a danger to people because the ceiling is looking like its going to just fall down. Plus all the barns are dropping to bits. The place is a danger. I am interested in the ownership of the farm, as I think it would make a lovely conversion and dwellings, bringing it back to life again. I would love to live there. My cousin Peter, is one of the off-shoots of the Nugent family in Stockton. If anyone wishes to contact lost relatives I could pass your details to him. I would be very interested in who actually owns Summerville Farm as I know someone who may wish to purchase the place. I have noticed the builders are working on the farm buildings and the land around the Summerville Farm on Durham Road. I was collecting brambles in the farmyard the other evening and the farmer, Mr Allen, had put a sign up saying ‘no shooting the rabbits allowed – private land’. Its good to see the vandals didn’t finish the old farmhouse as I predicted. I was told that the farm will be demolished very soon to build a road right through the land heading into Hardwick. Don’t know how right the information is, it seems a shame that it looks like Hardwick’s little green belt may disappear. As a small child I always thought that it was Emmerdale Farm till my amused mother put me right. I was pleased to hear my first Skylark today. Thursday 8th April. The skylark was in the field near to Summerville farm house. I wonder if the field and the farmhouse buildings will be there for the birds to return in 2011 or will the developers be on the land? The swallows will soon be arriving to build their nests in the farm buildings if the vandals allow them. I am interested in buying this farm to make my childhood dreams come true, of owning chickens and a pig and creating a stimulating environment for children – my own and others. Does anyone have any ideas as to where I could find out any info? I believe plans were submitted and approved by Stockton Council to build a new crematorium for the Teesside area a few years ago, but this was for land between Letch Lane and the Social Club on Harrowgate Lane, this land being part of the farm, I would think the planning approval will have now expired, the Crematorium never materialised. I have heard rumours that Summerville Farm has been bought by developers who are planning to create a shopping centre like Teesside Park – has anybody else heard anything? I believe it is still owned by the Co-operative Society but leased to a farmer from Northumberland. Does anybody know who owns this property? The buildings are abandoned and derelict so it looks like it is only the land that is used not. padlocked this time. The house and out building have been trashed and burnt by people. I recall leaving the farm in 1976 after finishing secondary school and would love to know more about Denis Nugents experience of living on the farm for the following twenty years. I used to live in Summerville Farm from 1965 untill 1976. My family moved to the farm when I was 5 years old from Yorkshire. My mother planted the apple tree and others that are in the front of the house which was also where we kept our chickens. Next to the chicken run was my mothers vegatable garden. My father bricked up an old bunker located at the back of the house where my mother had her rose garden. I have many fond memories of this farm, especially playing in the barn and old abbatoir with my friends. I have been living in the Netherlands for over 20 years and I thougtht the farm had been pulled down because a Tesco had been built there. This evening a friend who had recently visited Stockton, informed me the farm still exists and I that is why I am writing this comment to fill in any missing gaps in the history. I knew Don Wardle, the pigman, and would often go into the pigsty with my friends and there were times when the boar escaped from his sty and run around the yard at the back of the house which caused quite a stir. I hope to visit the farm in a couple of months as I hear it has been abandoned by its last tenents many years ago. I still have clear memories of living on this farm, some of which have haunted me for over 40 years. I would often dream of returning but when I heard that it had been torn down a number of years ago I gave up hope. Now I have a reason to return to England again. At the time my family name was Shepherd and my father’s name was Joe. Perhaps someone can still remember me or my family who once lived there 33 years ago. Denis died a few years ago in Faversham, Kent where he lived with my sister after our mother died. I live in Ladbroke Grove, London now and one of my chums down here is Ian Ingram who went to school with you. I’ve been told that the farm itself is now abandoned, however I’ve also heard that there are people squatting in the barn. I’d love to explore the farm and photograph it for a project, but if it has people living it then I’d rather not as I care about my safety, does anybody know exactly whats going on with it? Don Wardle used to keep his pigs at this farm & his sheep were kept in the field just before the B.P.Garage on Durham Road. Does anybody know who owns this farm now? I live in Stockton and grew up on Roseworth. I always remember walking past this farm when I was a kid on my way up to Castle Eden and always loved the place. Any info would be really appreciated. There were several trees near the gate entrance before the house, if they are still there you may find my initials carved on them that was nearly fifteen years or so ago so I should imagine they would be quite high up as I remember climbing the trees to carve them. Im sure there are others about the farm land, If it”s still all there. There were rumours for years, maybe a couple of decades, about extensions of the rabid estate”s onto my former home, My Grandad is Denis Nugent who I see has also left comment”s here. I now live near Kingston, Surrey with my Grandfather near by in Favisham, Kent. Seeing pics of the place after so many years stirs a lot of emotion. This is Summerville Farm House, where I lived for nearly 20 years, until 1995. This is Summerfield Farm opposite what is now Tesco on the A177 going towards Sedgefield . Further to my earlier comments, this was Sommerville Farm owned by the Co-op, managed and run by the Gray family, their parents were our next door neighbours in Craigweil Crescent. Could this be the farmhouse at the top of Durham road in Stockton just past the Horse & Jockey ? 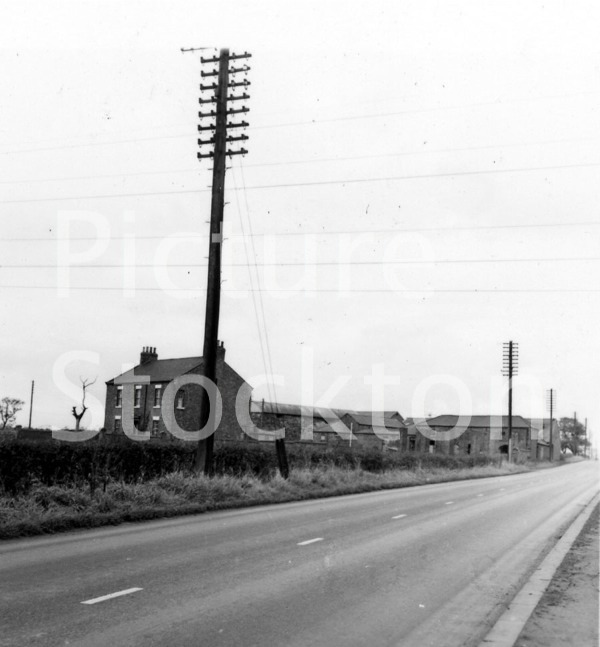 This photo could be Summerville Farm just past The Horse and Jocket Public House on the A177 opposite Tesco Supermarket looking towards Thorpe Thewels. This looks like the farm at the two mile house, (Horse&Jockey) on Durham Road, opposite where the Tesco store is now. It was owned by the Co-op at one time.